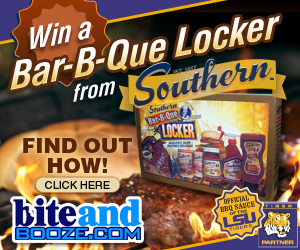 Our second winning recipe in the Southern BBQ Sauce Bar-B-Que Locker Contest came from Lawrence VanZomeren with SOLA Tailgating. The brine and the pork shoulder will be kept refrigerated overnight for no less than 8 hours. I will use the process of smoking the shoulder to cook the meat. Once done brining I will dry the meat with paper towel and apply the Southern Cajun rub extremely heavy. After the meat is removed from the smoker it will sit and not be touched for 30min in a pan covered with tin foil. After the resting period the pork will be pulled and the southern bar-b-q sauce will be added. The flavors of the brown sugar in the brine and the brown sugar sauce will come together very nicely. Special thanks to Matherne's on Highland at Kenilworth for supplying the meat!